File Photo- Taken at past blood drive on March 4th, 2015. 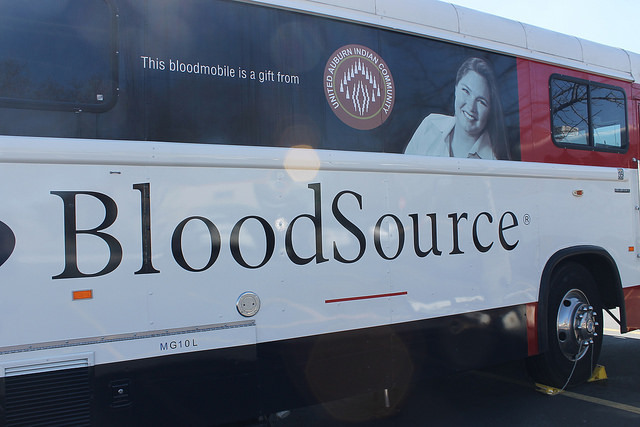 BloodSource van will be back on campus next Tuesday. The bloodmobiles are coming back to American River College on Sept. 29 and 30. Sponsored by the ARC Health Center, BloodSource will be on campus from 9 a.m. to 3 p.m. There will be bloodmobiles set up in Parking Lot B next to the Student Center and in the parking lot adjacent to Beaver Stadium. Donors are asked to drink plenty of water prior to donating and to bring a photo ID. ARC Health Center nurse Paula Whipple encourages students to take advantage of this convenient opportunity to donate. With their donation of blood, donors with receive a free “Life is Good, Give Blood” t-shirt. Student Senate Director of Legislative Affairs Laurie Jones shed some light on statistics involving blood donations. Students will also be able to join the Be the Match bone marrow registry. The Be the Match program provides marrow transplants in the United States from volunteer unrelated donors to patients in need. Be the first to comment on "Blood donations at ARC next week"